We love our Members. Their incredible support allows us to make a difference to animals both locally and all over the world. This month, we’re spotlighting a family of Zoo Members that deserve recognition. We’re thrilled to introduce you to September’s Featured Members: The Eikenburg Family. We asked the Eikenburg’s to share a few words about what being a Zoo Member means to them. Here’s what they had to say. 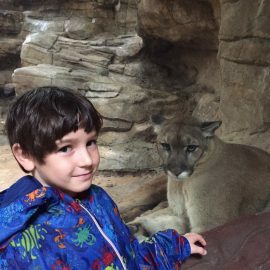 “Our Houston Zoo Membership takes raising our children from a labor of love to a literal walk in the park. Once we walk through the gates, our children get to take control, set the agenda and lead the way. Our son and I had another memorable visit at the recent June 4th Members’ Morning. The conditions were perfect – terribly early (for a Saturday) and rainy! The zoo was his to share with only the animals and zookeepers. The highlights of this excursion for my son were watching the Komodo dragon massage his back under the waterfall in his habitat and watching the mongooses’ morning feeding. At the feeding, the zookeeper patiently answered all his questions while doling out the vegetables. She then gently warned that the feeding was going to get a bit grisly as she shifted the menu to protein. My son was transfixed, loving every circle-of-life moment of the feeding. We take advantage of several of the programs that the Zoo offers. Top of the list has been Zoo Camp and the Swap Shop. Our son is always on the lookout for Swap Shop items when we are out and about. When he’s not able to provide physical evidence of the natural encounter, he’s quick to make a journal entry and share it with the staff. From all of us here at the Houston Zoo, we want to say thank you to the Eikenburg’s and all of our Zoo Members. As a Houston Zoo Member, your support truly makes an impact on the growth of our Zoo and conservation efforts. THANKS!